If there is one thing I know about then it’s gaming events. Not just because I have been to so many but also because I have been a big part of managing and organising some of the UK’s largest and most historic retro gaming expos including Revival, Jagfest UK and RetroVision. While I have now retired from running events due to my poor health, I still try to make an effort to support the ones that are still around. Nowadays there are so many gaming events on the calendar it’s getting pretty hard to keep track! But one of the event companies that have been around since the beginning are Replay Events. They have put on the biggest and best events on a yearly basis taking in cities such as Blackpool, London, Leeds, Birmingham, Glasgow and, of course, Manchester. Now you may remember that last year the show in Manchester was replaced with a second one in Blackpool, but this year it’s back with a bang on the weekend of the 4th and 5th of May. 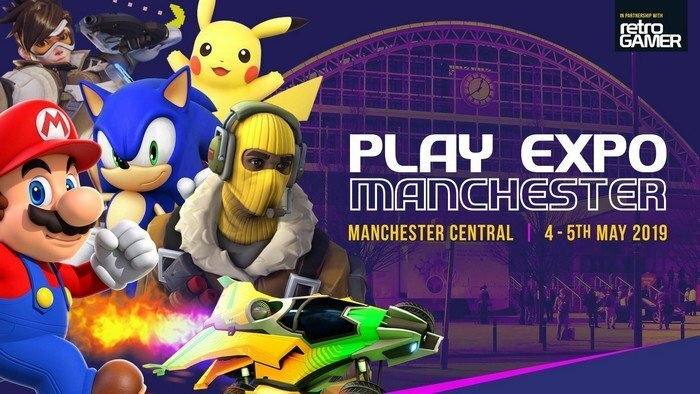 I thought it would be nice to give something back to the people behind some of my favourite events and give you ten reasons why you should be attending Play Manchester in less than 4 week’s time! If these reasons don’t persuade you then nothing will. So head over to their official website, buy yourself some tickets and I’ll see you there! Literally the first area I head for as soon as I visit any Play event is the arcade. I grew up in and around arcades and there is still nothing that quite matches the magic and nostalgia that these machines hold for me. While it’s sad that the days of those smoky neon lit arcades are well and truly over you can somewhat relive this experience at Play Manchester. And you can also do it without needing a pocket full of 10p pieces too as all the machines are set to freeplay! Pinball tables got pretty much hand in hand with arcade games so it’s no surprise to see that these will feature heavily at the event too. Play always have the largest selection of both arcade and pinball machines that you will see at any UK event. Of course, all the pinball tables, like the arcade machines, will also be set to freeplay for everyone to enjoy. There are also high score contents on some of the machines too for those who fancy themselves as a real pinball wizard!